Welcome home, Chase De Leo! The Anaheim Ducks traded for the 22-year-old La Mirada native Saturday, sending left winger Nic Kerdiles to the Winnipeg Jets. The lefty De Leo has only appeared in two career NHL games– including his debut against the Ducks in 2016– and has earned a +1 rating in those appearances; however, the 5-10, 185-pound center has caused havoc for defenders across the AHL. 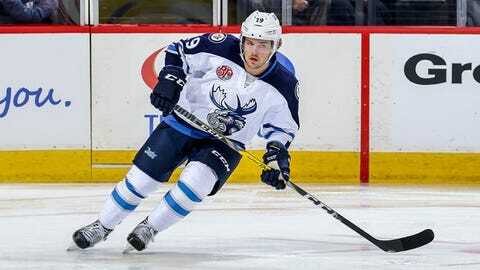 In 211 career games with the Manitoba Moose, De Leo earned 45-62=107 points with 77 penalty minutes (PIM). NEWS: We've acquired Southern California native Chase De Leo (@Dels9) from Winnipeg in exchange for left wing Nic Kerdiles. De Leo was originally selected by Winnipeg in the fourth round (99th overall) of the 2014 NHL Draft. He received a qualifying offer from Winnipeg as a pending restricted free agent, but now the Ducks will have the opportunity to sign the local product to his first non-entry-level deal ahead of the 2018-19 season. Kerdiles, 24, appeared in two games last season with the Ducks and had no points. In 49 games with the San Diego Gulls, he had 15 goals and 34 points.